EDINBURGH, Scotland — With Edinburgh's reputation as a rich live theater environment, we were not surprised to notice numerous theater venues on our way from the train station to our apartment when we arrived earlier this week. We definitely wanted to sample some of the offerings in a city that hosts not one but two annual performing arts festivals. After examining the productions scheduled during our six-day visit, we ended up with tickets to two performances. Both happened to be scheduled for today. Our afternoon matinee tickets were to a dark comedy called Pandas, which made its world premiere with this production at the Traverse Theatre. Set in Edinburgh in the spring, Pandas tells the story of three couples, whose lives become intertwined with each other and with various connections to pandas. James, a police detective, has hit the bottle and ignored his wife Julie once too often, and Julie is leaving him. Jie Hui, an enterprising entrepreneur, is regretting his partnership with shady dealer Andy to import panda-patterned rugs from China after customs officials begin breathing down their necks and Andy is shot. When James goes to the hospital to interview Andy about the shooting, he discovers his soon to be ex-wife at Andy's bedside. Then Andy's bitter ex Madeleine, a neurotic entomologist who studies panda lice, throws herself at James when he questions her about her whereabouts during the attack. Meanwhile, Jie Hui is dealing with his first visit from Lin Han, an internet matchmaking contact from China with whom he has exchanged 536 emails and 68 pictures. She is a wide-eyed pragmatist who matter-of-factly informs him that she is trying to decide whether to fall in love with him or not. Her family also happens to manufacture the panda rugs in question. The cast was uniformly excellent and served well by stellar directing, clever sets, and very sharp writing. Pandas clearly personified Edinburgh's theatrical excellence in black and white. With just enough time for a nice dinner and stroll in between performances, we made our way to the elegant Festival Theatre on Nicolson Street for our evening event. The location is Edinburgh's longest continuous theatre site, dating back to 1830 when Dunedin Hall was constructed there. Several reincarnations later, the Empire Palace Theatre opened at the location in 1892. Designed by a great British theater architect, the Empire was lavishly decorated and seated 3,000 people on four levels. For the next two decades, it hosted the top attractions of the period until a disastrous fire struck the theater on May 9, 1911. During a performance by the Great Lafayette, a famous illusionist and friend of Harry Houdini, an electrical fault in a lamp triggered an onstage fire. When the elaborate set caught fire, the audience thought it was part of the illusion and did not attempt to leave until directed to do so. A fire curtain was dropped, enabling the entire audience to escape unharmed, but all the performers, including the Great Lafayette, perished. Tonight's production at the Festival Theatre was a performance by well-known British illusionist Paul Daniels in tribute to the Great Lafayette and the 100th anniversary of his untimely death. It was part of a weekend festival of magic and illusion in honor of the great master, who was the highest paid performer of his time. Daniels paid homage to Lafayette by performing some of his tricks and in retelling the story of his career and last performance. Like earlier in the day, we were thoroughly entertained and glad to have been in Edinburgh on the day that this very interesting man was honored. 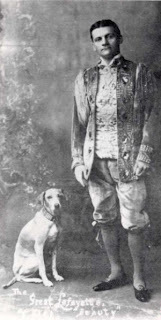 For more information about the Great Lafayette and his beloved dog Beauty, who was a gift from Houdini, check out the Great Lafayette Festival site.